Anthrax guitarist and co-founder Scott Ian has seen his share of dive hotels, dirty tour buses and decrepit green rooms. 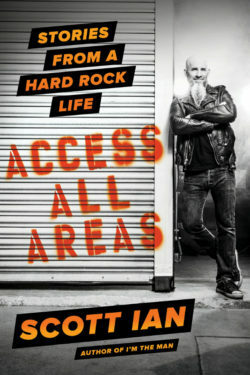 “Access All Areas: Stories from a Hard Rock Life” is a collection of his craziest stories recounting Ian’s life on the road as a touring musician. Along the way the guitarist shares his experiences and encounters with celebrities like Kirk Hammett, Dimebag Darrell, David Lee Roth and Steven Spielberg to name just a few. As the follow up to his autobiography “I’m The Man” guitarist Scott Ian takes readers even further into the depths of the heavy metal underworld. Unlike Ian’s first book which was a more biography than tell all where “Access All Areas” is the total opposite recounting in detail some of the writers more interesting encounters. Very rarely do you get to hear let alone read in published form stories like those shared by the veteran guitarist. From his experiences as a Pro Poker player playing alongside Kiss’s Ace Frehley and ZZ Top’s Dusty Hill to a confrontational meeting with REM front man Michael Stipe. Easily my favorite excert from the book was that where Ian sets the record straight about his guest appearance on “Married with Children” which was to include a story line featuring Christina Applegate. Over the course of “Access All Areas” 243 pages readers are treated to a bevy of laughable stories that have not been shared before. As I made my way through the book I just kept thinking that even having one or two of these experiences in a life time would be enough for most people but to be able to compile enough for a book was mind blowing. Scott Ian has certainly to this point lived quiet an interesting life full of off the wall experiences which he has candidly detailed in this book. 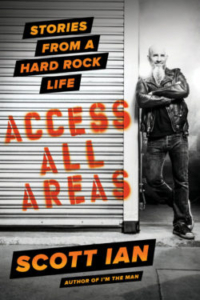 You don’t have to be a fan of heavy metal to enjoy this book as there are plenty of other colorful characters outside of the music world that you will surely recognize making “Access All Areas: Stories from a Hard Rock Life” a great pickup for any and all.